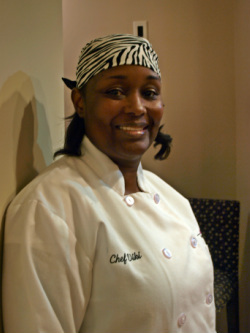 My name is Chef Viki Herring, and I have been a personal chef since 2008. Dinner For Two is my dream come true, it was started out of my passion for entertaining, fine dining and everything elegant. In 2001 while shopping for dinnerware, I could only find two plates, two glasses, etc. in the pattern I chose and I needed four! It was then that I got the idea for “Dinner For Two”. So, I started by cooking for friends and using them as official “tasters” and in 2008 after completing my MBA I decided it was time to step out on faith to go forth with my vision. My Business – My mission is to remain client-focused while offering personalized service down to the last detail. S. Truett Cathy put it best when he said "Food is essential to life, therefore make it good." I believe that the dining experience should be unforgettable from farm to table. I am here to share my passion and labor of love with you. In addition to my own experience in the kitchen, networking with other professionals in the industry provides me with mentorship, continuing education, and the latest in food trends. As an independent business owner, I am licensed, insured, and have a Safe Food Handler Certification.